Got recyclables? I do! And I’m always looking for a good STEAM project to use up some of these recycling bin supplies. 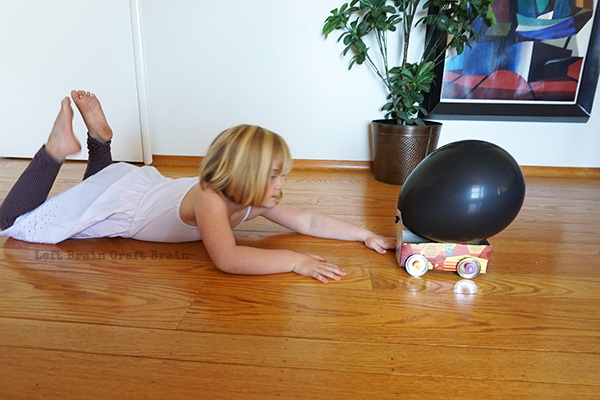 And these Upcycled Balloon Cars are a fave green STEM project. So start digging through the bin and start building! I like to keep a stash of recyclables in the house for projects. I actually have a layer of my mini makerspace cart filled with them. 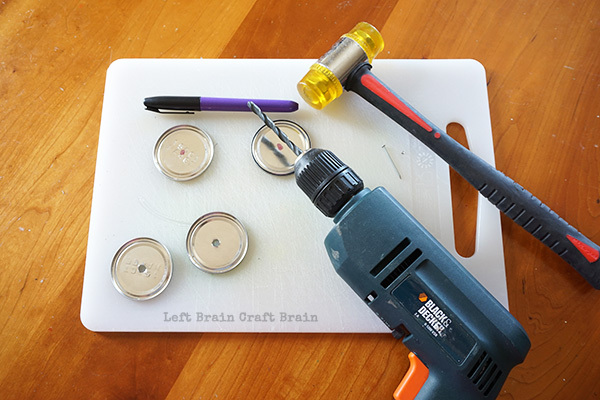 But some times, you might need to plan dinner around the parts you need. So my girl and I headed to the grocery store for some necessities AND to pick up some car parts. It became a cool engineering brainstorming session because I asked her to look for things that could work as the car parts. 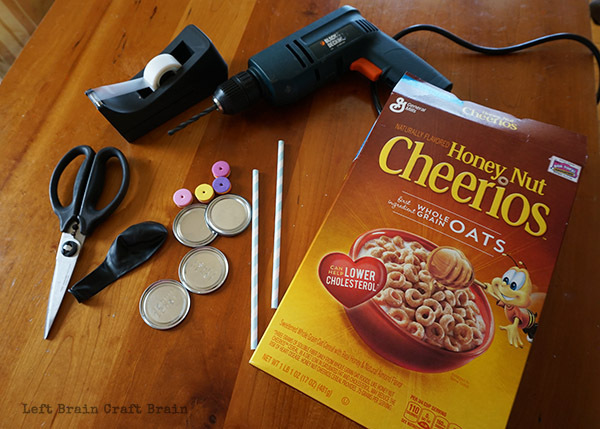 She found some biscuit can tops for wheels and lots of boxes of things like cereal and granola bar. 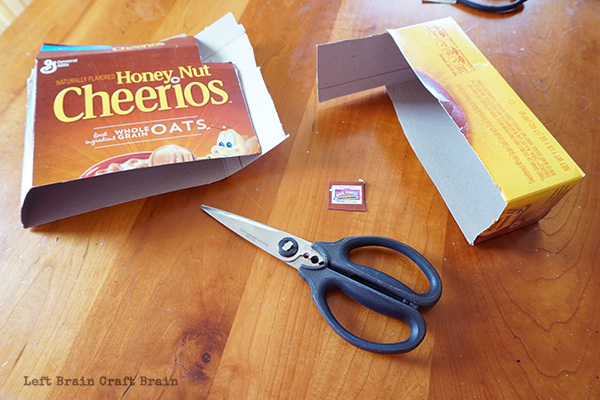 First, cut out your Box Top and set aside. Then cut the bottom 1/3-ish off the box, with one of the narrow sides cut at about half level. It’s hard to describe, so take a look at the picture. This higher piece will hold the balloon. Cut a small 1 cm x 1 cm hole in the tall flap to hold the balloon. Now it’s time to make holes in the wheels for the axles. I used a drill for this and recommend some adult supervision. First poke a small hole in the middle of the wheel with a nail and hammer. Then check your straw size and grab a drill bit a bit bigger than your straw. Then hold tight to the wheel and drill. Careful, these have a tendency to spin so using a clamp or drilling onto a safe surface like a block of wood is ideal. To assemble the car, poke four holes into the sides of the car for the axles. 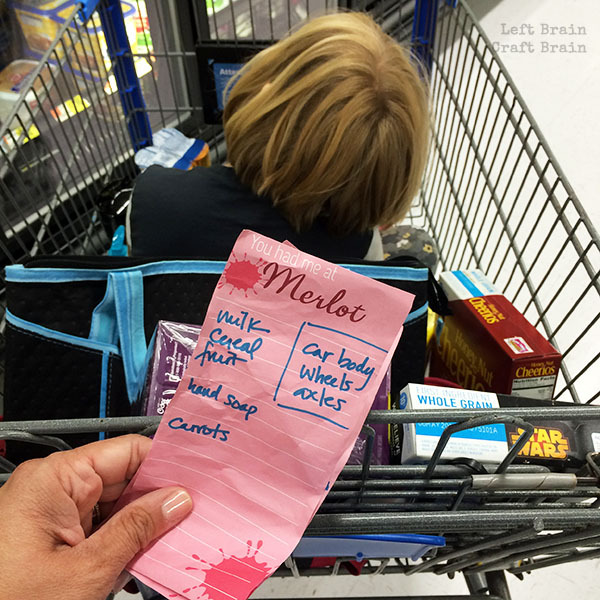 Two things to keep in mind: 1) Use a ruler to keep them at the same position on each side. Otherwise your car will drive wonky. 2) Make sure that the wheels touch the ground and that the center of the wheel overlaps the cardboard far enough that you can make a hole. 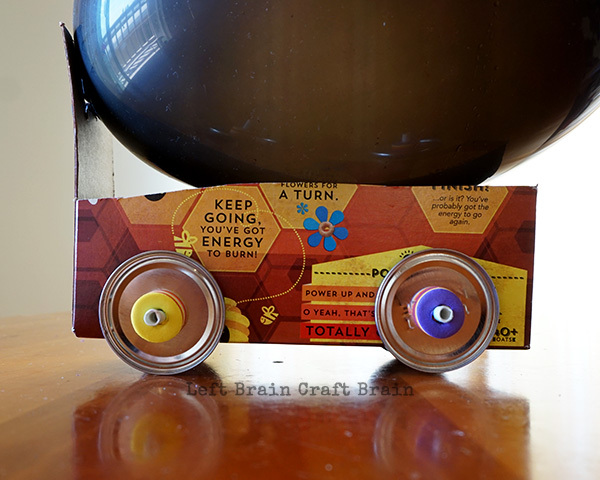 Feed your straws through the holes, then add the four wheels and the foam bead hubcaps. If the holes in the hubcaps aren’t big enough, take the drill bit (without the drill) and dig them out a bit. Make sure your wheels spin freely and cut any extra straw length off the ends. What Makes a Balloon Car Drive? 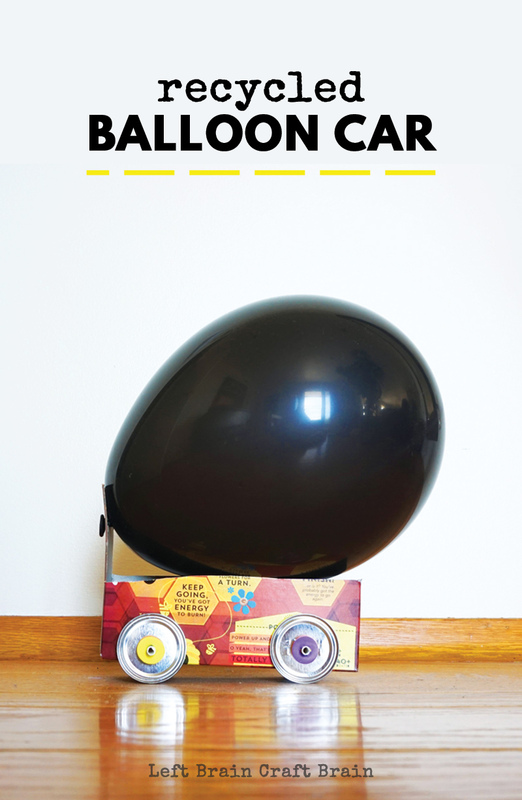 There’s some pretty cool science and engineering behind balloon cars. They seem to self-propel, but the power comes from wind power. 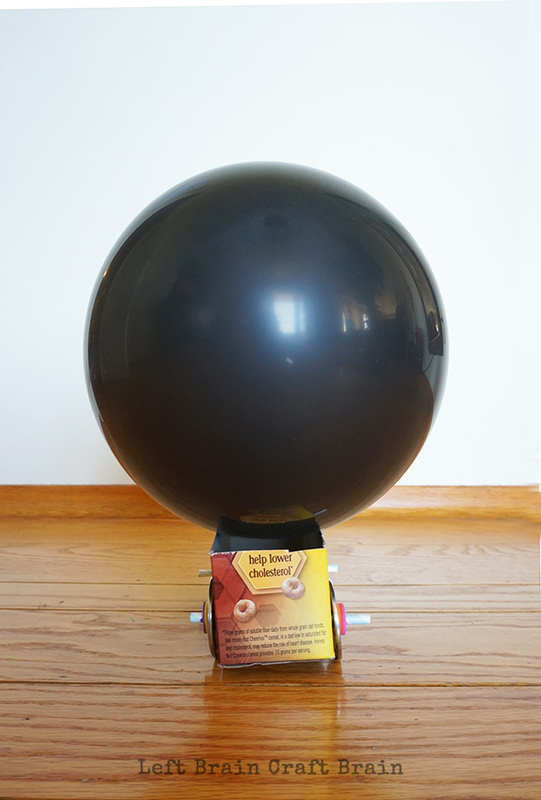 As the air rushes out of the balloon, the car moves in an equal force in the opposite direction. When the kids are optimizing their cars, ask them to think about ways to mazimize this force by thinking about friction that will slow down the car. 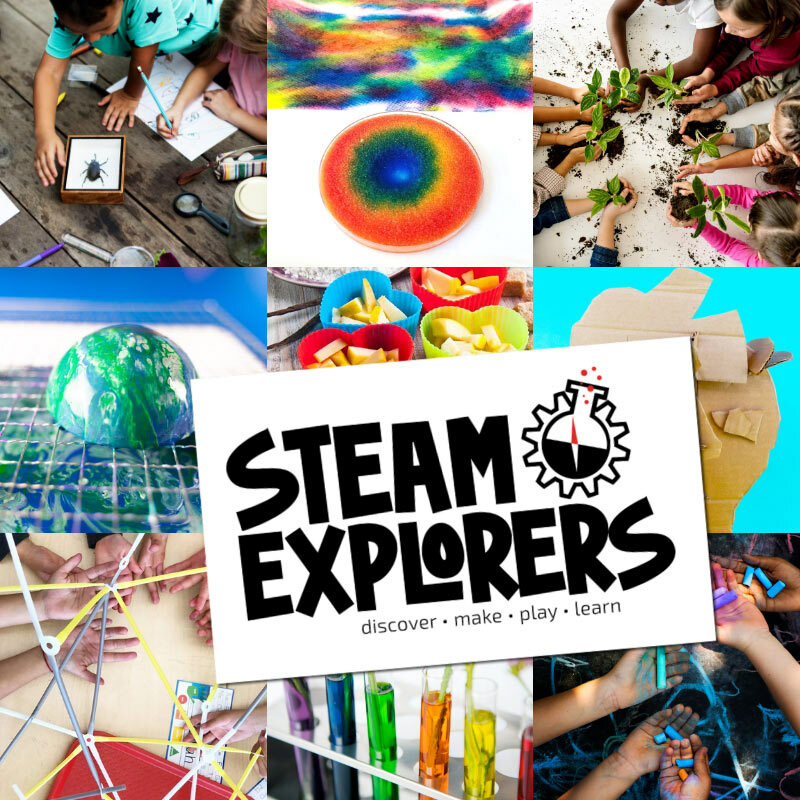 Want to raise some money for school why doing STEM? 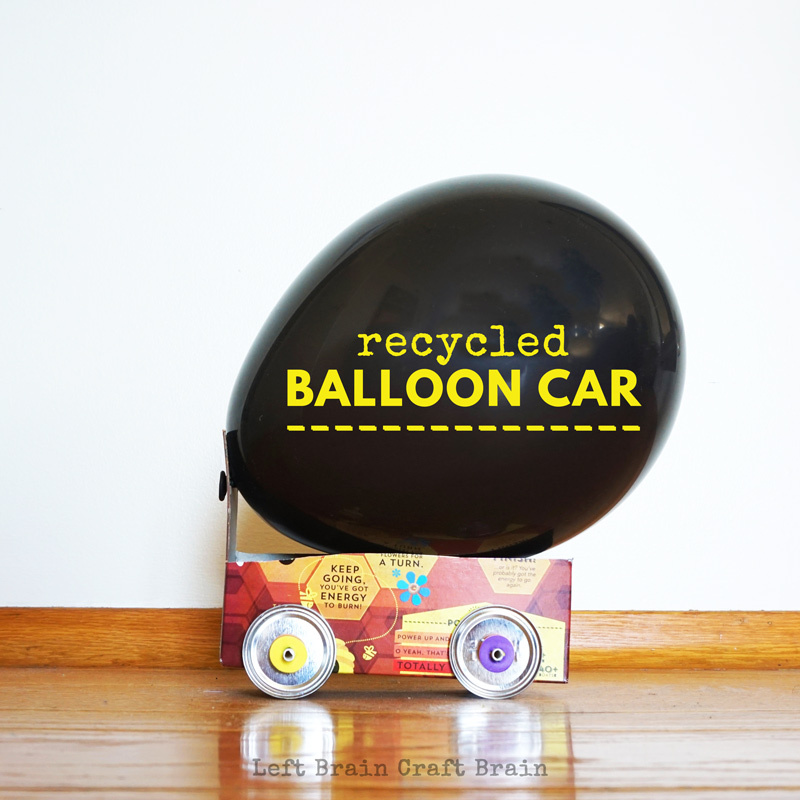 Host a recycled balloon car derby! And gather up all those box tops for cash for school. First thing you need to do is rally the school! Nothing like a little bit of competition to help raise money. Each student makes and races a recycled container balloon powered car. You could do it in class or make it a whole school party on a Saturday. Just be sure to tell everyone to look for potential car parts that earn Box Tops 4 Education like Cheerios. Cardboard is an awesome and cheap craft material. 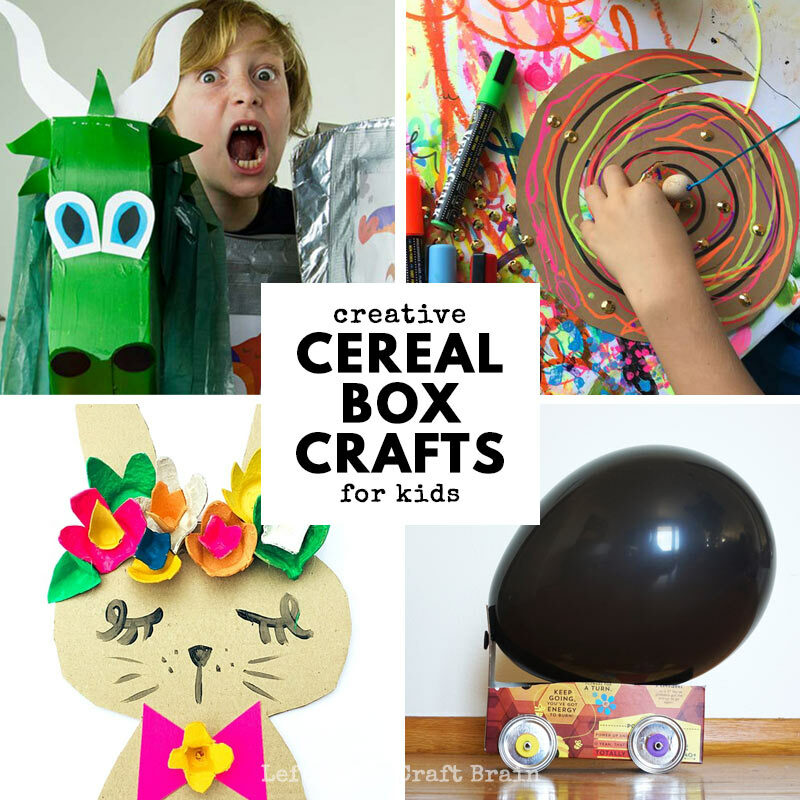 You’ll love these 30+ Super Creative Cereal Box Crafts for Kids. STEM can get expensive. But it doesn’t have to be! 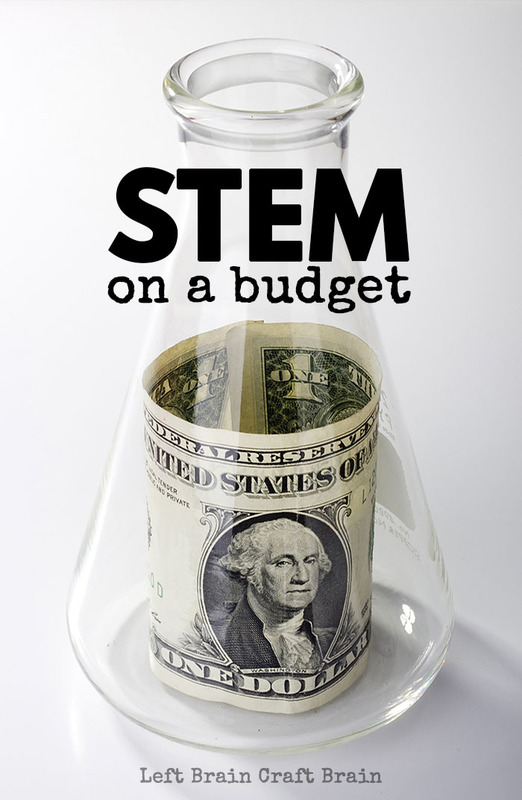 Check out these STEM on a Budget Projects for ideas to bring the fun with only a little bit of cash.